Do you know what to do if your company suddenly becomes a victim of ransomware? Are you going to end up paying the ransom without any guarantee your valuable data will be returned to you? 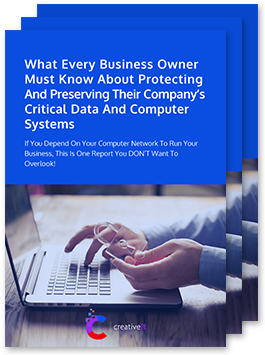 When it comes to protecting your business from a ransomware attack, unfortunately, there is no single piece of software that you can install to receive 100% protection. However, with Creative IT Ransomware Protection services, we’ll take incremental measures and best practices to help you stay safe from the damaging threat of extortion before it reaches your systems. Employee Cybersecurity Training – employees are often the target of attack for most cybercriminals, protect your business with our threat testing and employee training. You worked hard to get your business off the ground, don’t let your hardware be held ransom by some cybercriminal.